WASHINGTON (CNS) — The nation’s early feminists who fought for women’s suffrage and other rights totally rejected abortion, Serrin Foster, president of Feminists for Life of America, told the Cardinals for Life student group at The Catholic University of America. So the notion today that true feminists support abortion is simply wrong, said Foster, who has led the Virginia-based Feminists for Life since 1994 and is the creator of the “Women Deserve Better” campaign. 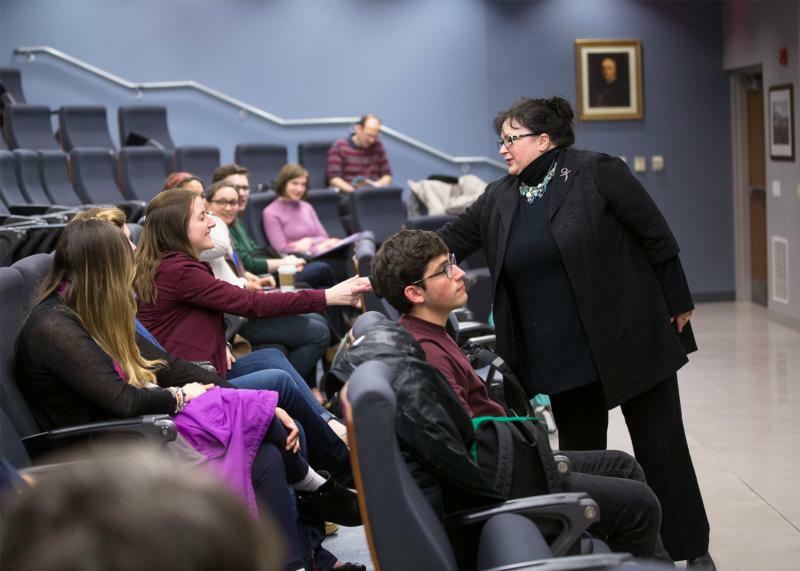 An audience of about 30 students — young women and men — listened to her speak the evening of March 20 on “The Feminist Case Against Abortion,” a landmark address she has delivered over the last 20 years. Susan D. Anthony, Elizabeth Cady Stanton, Lucretia Mott, Victoria Woodhull, Alice Paul and many others advocated for women’s right to vote and for equality in the law so they could be “self-sustaining and self-reliant” at a time when women weren’t allowed to own property, control their own money or even sit on a jury. They also pushed for an end to slavery. But to a woman, they condemned abortion “in no uncertain terms,” said Foster. Modern feminists such as Betty Friedan, she explained, did not support abortion in their own fight for women’s equality — until the male founders of what became the National Abortion Rights Action League, known today as NARAL Pro-Choice America, persuaded them to include “abortion rights” in their platform. The two men were the late Lawrence Lader, considered the “father of abortion rights,” and the late Dr. Bernard Nathanson, who later regretted the tens of thousands of abortions he had performed — or oversaw — and became a staunch pro-life advocate. He also converted from Judaism to Catholicism. Foster said Lader and Nathanson’s legitimate concern was that many abortions were being performed in unsafe conditions and they felt if the women’s movement backed abortion, this would lead to safe abortions. They also thought this would help expose “the discrimination and injustices” women endured, she said. Feminists for Life refuses “to choose between women and children” and is “dedicated to eliminating the root causes that drive women to abortion,” including pressure to choose between keeping a job or staying in school and having their baby, facing financial problems, and being without paternal and/or familial support. College outreach is the organization’s flagship program — focusing on ways America’s campuses can be more accommodating to pregnant students and young parents, with campus groups and school administrators working together to come up with solutions. She gave a host of examples of efforts by student groups at Catholic and secular universities, like holding fundraisers to help pregnant students get the items they need when their baby is born or pay for day care, starting a baby-sitting club and supporting initiatives to help pregnant students and young parents find housing. Feminists for Life also encourage campuses to host a Pregnancy and Parenting Resource Forum, bringing service agencies and resources together to inform pregnant students and young parents what help is available to them. “That applies on the institutional level — whether you’re a public university or a private one like us, a large company or small business — but also on a personal level,” she said. “Commit yourself to serve and you’ll be able to. … A big problem I’ve noticed among college students is that these problems seem so big and impossible to tackle, we resort to theoretical/ ideological thinking right away and kind of give up on effecting concrete solutions.